Xtreme lighting has many options to get things working and to simplify your installation. We offer everything from wiring kits, LED flasher units, and switches to make life easier and customize your vehicle. Compact In-line LED light flasher unit will condition the 12 volt output line on any string of LED lights and add a flash mode that increases the visibility of your vehicle. The flash rate is a F-F-F-pause, F-F-F-pause, so the rapid 3 flash and pause is what is typically used on utility and emergency vehicles. Line can hold up to 50 LED lights and is super compace, only 1" module with the 2 input and 2 output wires. Typically the flasher would be installed on the 12 volt line after the switch and then grounded. All lights in the line must be LEDs or damage to the controller will occur. Waterproof casing can be mounted at first light or next to the line control switch. Working voltage is 9 - 16 volts. Sold per each flasher module. Compact In-line LED light flasher unit will condition the 12 volt output line on any string of LED lights and add a flash mode that increases the visibility of your vehicle. The 2 channel version gives 2 lines (typically a red channel and blue channel) for official or emergency vehicles. The flash rate is a F-F-F-pause, F-F-F-pause, it alternates left channel, right channel, both channels, and repeat, so the rapid 3 flash and pause is what is typically used on utility and emergency vehicles. Each line can hold up to 50 LED lights and is super compace, only 2" square module with the 2 input and 4 output ( 2 for each channel) wires. Typically the flasher would be installed on the 12 volt line after the switch and then grounded. All lights in the line must be LEDs or damage to the controller will occur. Waterproof casing can be mounted at first light or next to the line control switch. Working voltage is 9 - 16 volts. Sold per each flasher module. 4- 1 watt Hi-power LEDs in an aluminium housing. 4" long, the pair of lights use 8 watts, .6 amps and put out 1500 lumens of light. This is packaged and made for a strong amber light as needed for official use vehicles and emergency persons. Work well with our LED strobe controller (p/n: BL-FLASH or the 2 channel flasher BL-FLASH2). Packaged in a pair with mounting hardware. Many of these are used on construction, snow plows, utility, or snow groomer applications. 4- 1 watt Hi-power LEDs in an aluminium housing. 4" long, the pair of lights use 8 watts, .6 amps and put out 1500 lumens of light. This is packaged and made for a strong blue light as needed for official use vehicles and emergency persons. Work well with our LED strobe controller (p/n: BL-FLASH or the 2 channel flasher BL-FLASH2). Packaged in a pair with mounting hardware. 4- 1 watt Hi-power LEDs in an aluminium housing. 4" long, the pair of lights use 8 watts, .6 amps and put out 1500 lumens of light. This is packaged and made for a strong red light as needed for official use vehicles and emergency persons. Work well with our LED strobe controller (p/n: BL-FLASH or the 2 channel flasher BL-FLASH2). Packaged in a pair with mounting hardware. This item is a short 4" wire pigtail on the FEMALE connector used on the Brite Lites LED Light Bars. (Both the Double Row and Single Row). Use this to connect up to the male connector on all Brite Lites Wiring Harnesses or to make your own custom wiring for lights. Triple seal for water tight use. Male connector also available seperatly. 1 Female connector in this item. This item is a short 4" wire pigtail on the MALE connector used on the Brite Lites Wiring Harnesses. (Both the Deluxe and Standard). Use this to connect up to the female connector on all Brite Lites LED Light Bars or to make your own custom wiring for lights. Triple seal for water tight use. Female connector also available seperatly. 1 Male connector in this item. This our best and most complete wiring harness kit. Designed to make the connection of LED/HID lights on a vehicle a snap. Complete with relay, fuse link, heavy wiring to the battery, and a simple dash mounted switch for most UTV, ATV, Golf cart, or small vehicle applications. Can be customized and a custom switch can be used instead of the one supplied. 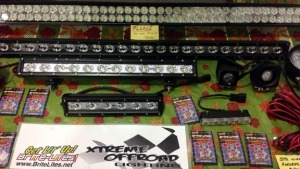 Enough to use on one large LED light bar and has moulded plug to connect directly into the Xtreme Off-Road Brite Lites light bars (both Double & Single row versions). If using on HID light or custom application, cut the connector off and wire direct. Rated for use up to 300 watts on Light bar or lights. This our best and most complete wiring harness kit. Designed to make the connection of 2 seperate located LED/HID lights on a vehicle a snap. Complete with relay, fuse link, heavy wiring to the battery, and a simple dash mounted switch for most UTV, ATV, Golf cart, or small vehicle applications. Can be customized and a custom switch can be used instead of the one supplied. Enough to use on one large LED light bar and has moulded plug to connect directly into the Xtreme Off-Road Brite Lites light bars (both Double & Single row versions). If using on HID light or custom application, cut the connector off and wire direct. Rated for use up to 300 watts on Light bar or lights. This our smaller vehicle wiring harness kit. Designed to make the connection of 2 LED/HID lights on a vehicle a snap. Complete with relay, fuse link, heavy wiring to the battery, and a simple dash mounted switch for most motorcycle, ATV, or small vehicle applications. Can be customized and a custom switch can be used instead of the one supplied. Wiring outputs are open ended wires to splice into the light at 2 locations, up to 4 feet apart. Total rating for lights is up to 150 watts. This our best and most complete wiring harness kit. Designed to make the connection of LED/HID lights on a vehicle a snap. Complete with relay, fuse link, heavy wiring to the battery, and a simple dash mounted switch for most UTV, ATV, Golf cart, or small vehicle applications. Can be customized and a custom switch can be used instead of the one supplied. Enough to use on one large LED light bar and has moulded plug to connect directly into the Xtreme Off-Road Brite Lites light bars (both Double & Single row versions). If using on HID light or custom application, cut the connector off and wire direct. --SOLD OUT--BLACK FRIDAY SALE- 50% Off - Was $30 - now $14.99 --SOLD OUT-- This our simple wiring harness kit. Designed to make the connection of LED/HID lights on a vehicle easier and give a good starting point. Complete with heavy wiring to the battery, and a simple dash mounted switch for most UTV, ATV, Golf cart, or small vehicle applications. Can be customized and a custom switch can be used instead of the one supplied. Enough to use on one large LED light bar and has moulded plug to connect directly into the Xtreme Off-Road Brite Lites light bars (both Double & Single row versions). If using on HID light or custom application, cut the connector off and wire direct.